"The world will not be destroyed, it will simply change." Japanese animation has come a very long way. From the stylings of the 1960s (Astroboy, Tobor The 8th Man) up to the present, this genre has grown in leaps and bounds. Arguably, it has also been imitated very much by Western animation, despite the fact that, ironically, anime emerged imitating popular Western cartoons. While anime has had several high watermarks, Blue Submarine No.6 is, without a doubt, the highest one yet. Though the mini-series is a technically interesting achievement (seamlessly blending 2-D and 3-D animation techniques together), it also tells an amazingly creative, emotional story. In the distant future, the polar icecaps have melted away, drowning much of the Earth's surface and forcing mankind to live a new kind of life. Mankind's armies have turned towards submarine-based combat, and underwater vehicles become more the norm than anything else. In this future, the mysterious scientist, Dr. Zorndyke, has helped to engineer all sorts of mutants and strange, often monstrous, aquatic creatures. For reasons unclear, he sets his genetically engineered "children" against the rest of humanity from his base in Antarctica, starting a war that could mean the end of the known world. The Blue Submarine fleet decides that the only way to stop Zorndyke's plans is to launch a major offensive against Antartica, eventually destroying it with nuclear weapons. 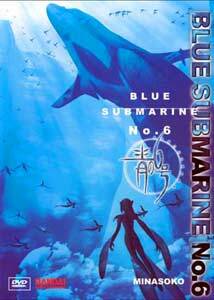 The crew of the Blue No.6 decides that, in order to help ensure success, they should enlist ex-sub fighter Tetsu Hayami. Though at first he refuses to rejoin the military, he is forced to when Zorndyke forces destroy his hometown. And so, the plan is set in motion: to destroy Zorndyke even if it means using nuclear weapons and possibly making the world condition worse. Though split into 4 episodes of about 30 minutes each, Blue Submarine No.6 is more like a movie than a traditional series. The narrative abandons the setup, and mainly focuses on one element: mankind's final battle with Zorndyke. By simply accepting the backstory, a very long, possibly boring, opening is avoided in favor of simply an entertaining, straightforward presentation. What follows is an amazing adventure that not only combines incredible visuals and action sequences, but also has a beautiful fantasy element underneath it. Here, in episode 4 (entitled Minasoko), Tetsu Hayami decides to travel to Antarctica first, ahead of the fleet of submarines poised to attack. He believes, as does Mayumi Kino, if he can simply talk with Zorndyke, he may be able to end the war peacefully. Meanwhile, Zorndyke's "child", the sharkman-like Verg, still has plans up his sleeve to destroy the human navy with nuclear torpedoes. What will undoubtedly strike most viewers is the mixture of 2-D cel animation with advanced computer graphics. Actually, all of the animation was computer enhanced, mainly the coloring of the normal cels. Some anime has experimented with this technique, but it has never really been more than a slight enhancement or gimmick. The incredibly seamless and smooth way in which the advanced CG mixes with the 2-D characters makes the show amazing to watch. The recent film, Titan A.E., used a similar technique, but Blue Sub seems to command this style with far more expertise. There are not enough synonyms for 'beautiful' to accurately describe the entirety of the series. The story is just as amazing as what you see on screen. While many anime series are content with standard ideas, here we have a unique fusion of high-tech action/adventure (the submarines and their underwater battles) with a pro-environment theme that touches on fantasy (the mutant people and their culture). If I didn't know the staff behind this, I might suspect Japanese artist Hayao Miyazaki (Nausicaa, Princess Mononoke) had a hand in it from this subject matter. It's sort of an unintentional reaction to Blue Sub to think, "Wow, this would make a great movie." But then you realize how stupid that thought is when, right in front of you, you already have it. It doesn't need live-action or any other enhancement to legitimize it, it is already one of the great, cinematic achievements of this day; an epic that has yet to really see its day in the sun. Image Transfer Review: Blue Submarine No.6 features one of the most amazing, pristine transfers I've ever seen for animation. Though I cannot confirm it, I'd guess this might actually be a directly digital transfer (much like Disney's recent animated DVDs). It's perfect. There's no other way to describe it. Everything leaps off the screen with absolutely clarity, brilliant color balance, and an amazing attention to detail. You can't even find pixelization or compression artifacts if you try and the disc runs at a constant 9-10mbps bitrate. Subtitles are yellow and easy to read with no problems. Audio Transfer Review: The Japanese audio track features an outstanding Dolby 5.1 mix, filled with directionality and amazing acoustics. It's extremely immersive and really brings you into the movie. The battle sequences have just the right about of bass kick to them, and the torpedo battles might just give movies like U571 a little run for their audio money. This is easily in the upper crust of animated 5.1 mixes and will satisfy fans, no question. The English dub version features a very muted Dolby 2.0 Surround mix. The dramatic downgrade in general quality and power will hopefully drive more people towards the Japanese track, which is far better. The 2.0 doesn't quite have the same acoustic feel, and the voices and sound effects are no longer quite as directional. 10-minute summary of episodes 1-3. Extras Review: Should you, for whatever reason, buy or rent episode 4 before watching the first 3, a very good summary of the past episodes is presented. The only other major feature is a lengthy, 20-minute "making-of" feature, which mostly consists of interviews with the creators of Blue Submarine No.6. While this is a good feature (available only in Japanese with subtitles), for some odd reason the interviewees are placed in some, strange club-style environment with strobe lights. This makes watching the feature a little annoying, visually. Trailers for other Pioneer/Bandai releases are here as well. The menus are nicely animated, but take ages to load. My one big complaint with this disc (very big), is that there is NO way to access the disc's menu from startup. You are forced to watch many promotional logos, copyright warnings, and even a Dolby Digital trailer before you gain access to the menu. Stopping the disc and pressing the menu button didn't help, either. There seems to be almost no way around this 10-12 minute reel before the menu. Should you, like me, accidentally press the 'title' button on your remote, you will find yourself having to sit through all this stuff again. At first, I was annoyed that a 2 hour show was being expanded to 4 discs. But, given the stellar, reference quality of both video and audio, perhaps the lack of heavy compression is the ultimate payoff for the disc splitup. Regardless, episode 4 is just as every bit good as the first 3. Find this animated gem wherever you can and rent or buy. Highly recommended.